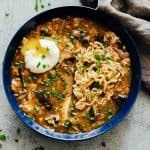 Chinese Hot and Sour Soup with Ramen - One pot comfort food! 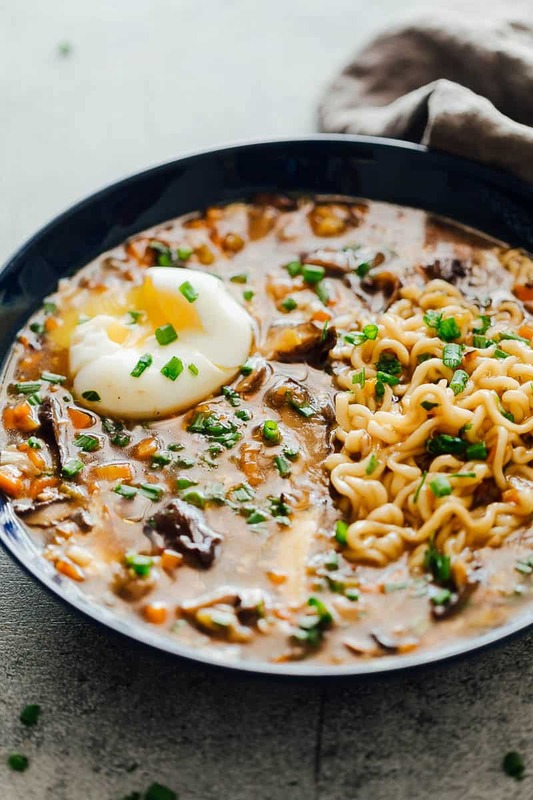 Incredibly delicious Chinese Hot and Sour Soup with Ramen is the perfect comfort food that’s ready in under 30 minutes! It’s a hearty meal, full of veggies, tofu, mushrooms and chicken. I have never had such an incredible response to a recipe even before I posted it. I made this chinese hot and sour soup with ramen a couple of days ago and ended up posting this picture on Instagram and since then I have received soooo many requests for the recipe that I was almost feeling guilty about not being able to do write this up earlier. You can actually go and read all the comments! I’m basically soup binging right now. Because after the holidays, I can’t look at another pie or cookie or dessert and I just need simple, healthy food before the onslaught of New Years eve. Lets just say – this soup has kept us going for two days now and we are still not over it. This is a really simple recipe that uses up a ton of veggies and particularly mushrooms. I ended up using three kinds of mushrooms because we are all mushroom lovers here. But you can stick to one. Tofu, chicken and pork are all standard ingredients in this soup. But you can decide which ones you like or even use a combination of two types of protein. Lets quickly jump in answer a few simple questions you might have before we get to the detailed recipe. 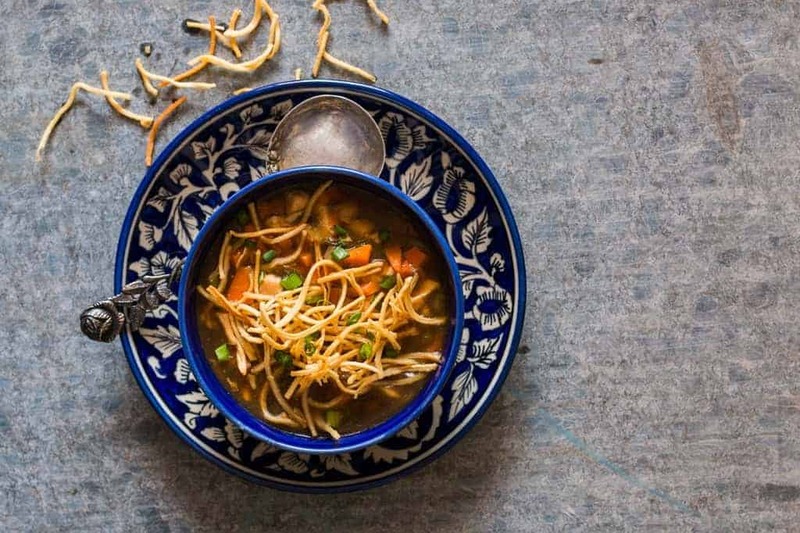 What goes into this chinese hot and sour soup with ramen? 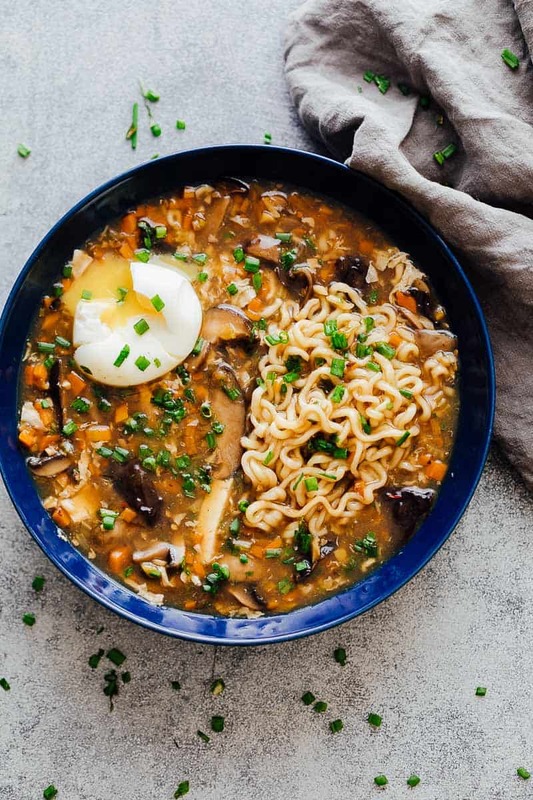 The list of ingredients in this chinese hot and sour soup with ramen is simple – chillies, ginger, garlic, celery, carrots, mushrooms, tofu, chicken, soy sauce, cornstarch, vinegar and ramen of course. These are things that are probably already in your pantry so its a quick and easy soup to make which is ready in under 30 minutes. Perfect for last minute dinners! Plus leftovers make for fantastic light lunches. What makes chinese hot and sour soup hot? The heat in this chinese hot and sour soup with ramen comes from dried red chillies and white pepper. The soup has to be on the hotter side. The sourness comes from adding vinegar right at the end. If you add the vinegar in the beginning or towards the middle, the vinegar will evaporate during cooking. Which is why add the vinegar right at the end. Does chinese hot and sour soup have gluten? Normally, chinese hot and soup does not have gluten but my version does because I add ramen noodles to it. If you skip the noodles, this will become a gluten free recipe. 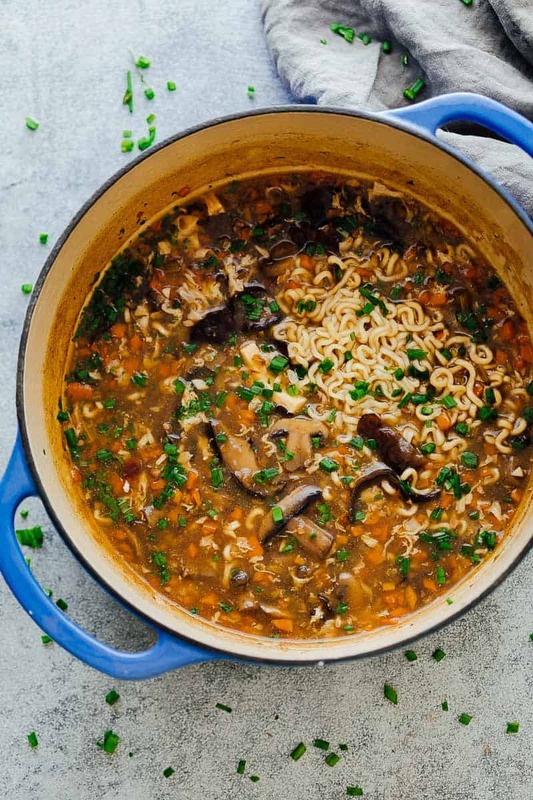 This chinese hot and sour soup with ramen is one of those easy soupy meals that everyone in the family will love. 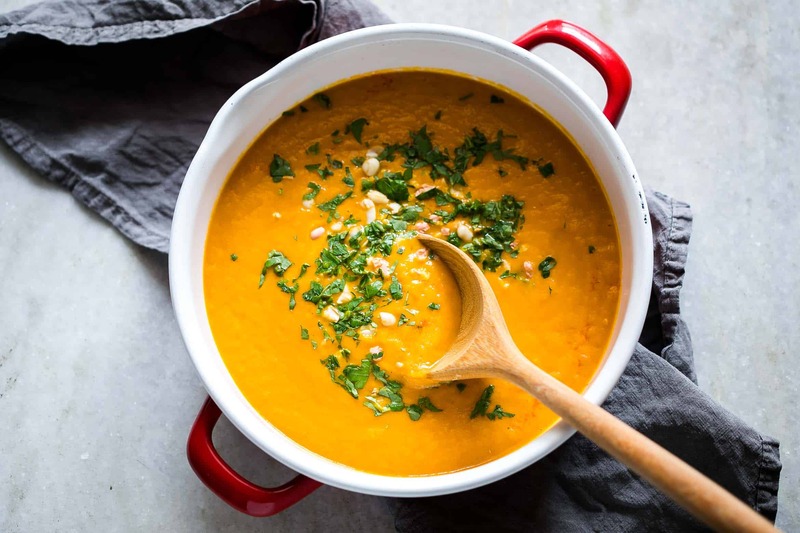 You can turn down the heat if that’s what you prefer but personally, I like that this soup clears up the sinuses and keeps me warm! Prep the mushrooms: If using dried shiitake and wood ear mushrooms, rehydrate them by submerging them in hot water for 15-20 minutes till they soften up. Reserve the water to be used as stock in the soup. Slice all the mushrooms and set aside. Saute: Heat oil in a pan and add red chillies and ginger. Saute till the ginger is golden brown and add the garlic. Saute the garlic for a few seconds and add the celery and carrots. Cook the carrots for a minute or two and add mushrooms, tofu, both the soy sauces and six cups water to the pot (if using the stock from mushrooms, reduce the water to 5 cups and add the stock). Bring the pot to a boil and simmer for 5-6 minutes. Add the ramen to the pot. Thicken: While the ramen is cooking, stir together cornstarch in 1/4 cup water and slowly add it to the pot while stirring continuously. Bring the soup to a quick boil. The soup should start to thicken. Slowly add in the beaten egg, swirling with a ladle as you go to create egg ribbons in the soup. Stir in rice vinegar, white pepper, salt (if using) and sesame oil. Turn off the flame. Top with an egg or just some green onions and enjoy. Ramen: Feel free to skip the ramen altogether if you prefer just soup, but I’m a sucker for noodles! I must try this! I can eat soup all day everyday! this totally hit the spot!!! thank you! This looks so awesome and good! 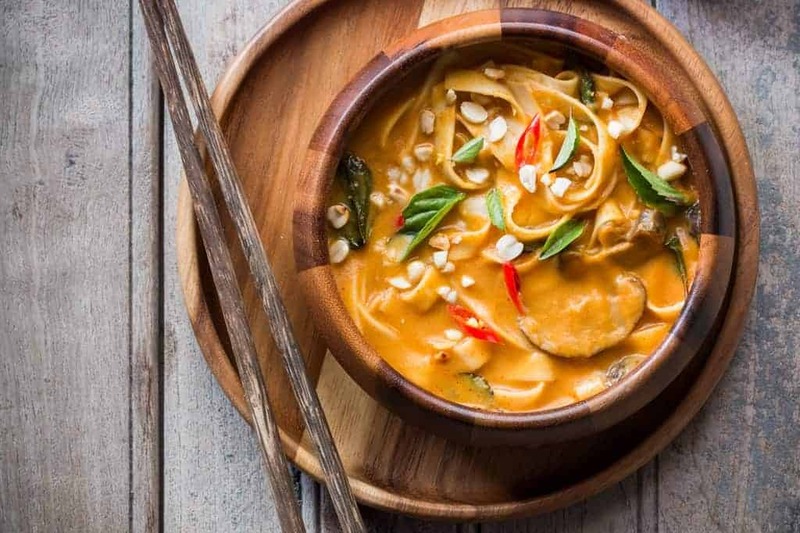 Rice noodles or buckwheat noodles (100%) might make good gluten-free substitutions.